Closed-loop electronic boost controllers (electronic boost controllers that rely on manifold pressure feedback) have had their problems in the past. The most common problem we've seen is boost fluctuations (often up to a couple of psi) either side of the preset boost ceiling; the control systems are constantly overshooting and pulling back near the maximum boost value. 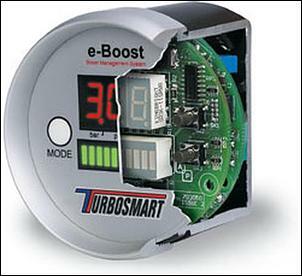 The e-Boost is an electronic boost control system that can be bought through the AutoSpeed shop for AUD$849 (with free postage within Australia). That $849 buys you a 66mm diameter e-Boost display/control unit, an electronic boost solenoid and everything you'd need for installation - various hoses and fittings, a wiring loom, in-line fuse and even cable ties. Note that there are two versions of the e-Boost available - the FG-EBOOST-40 is intended for boost pressures up to 40 psi (2.72 Bar) while the FG-EBOOST-60 is for extreme applications that call for up to 60 psi (4.08 Bar). 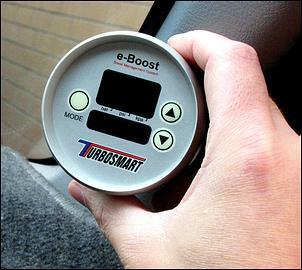 Like any boost control system, the e-Boost should not be installed by anyone that doesn't have a good knowledge of turbo systems; TurboSmart recommends fitment by an appropriately qualified technician. Having said that, though, the e-Boost is quite straightforward to install - it simply takes care. The first step is to mount the e-Boost display/control unit. TurboSmart supply a bracket that fastens to the rear of the unit so that it can be panel mounted; alternatively, it can be fitted inside a 66mm gauge cup. Note, though, the e-Boost is rather large - too big to fit in a DIN size opening, for example - and you may find it a challenge to find an ideal mounting location. Certainly, the A-pillar would allow easy viewing and adjustment but be wary that this location may be illegal in some states and territories. For the sake of testing we kept our e-Boost hidden in the glovebox. Next, securely connect the supplied 2.5mm diameter polyurethane hose to the fitting on the back of the unit and route it through the dashboard to an opening in the firewall; take care not to kink the hose or this may affect performance of the unit. Furthermore, the polyurethane hose should not be subjected to the hot under-bonnet environment, so use the supplied connecting barb to step up to a 3mm ID silicone hose from the firewall forward. 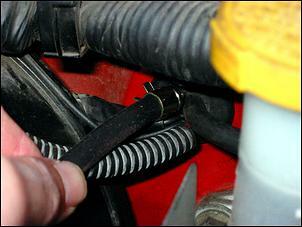 Connect this hose to the intake manifold using one of the supplied clamps. 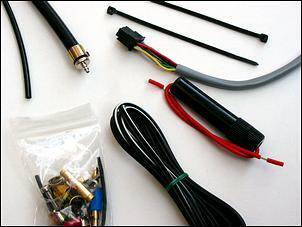 This hose provides the e-Boost unit a pressure signal for closed-loop boost control as well as its boost display. 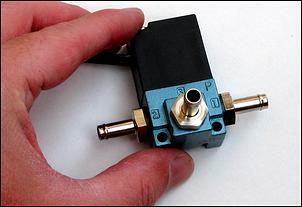 Now comes mounting the under-bonnet electronic solenoid and plumbing it to your existing turbo system. The e-Boost boost solenoid should be located at least 25cm away from the turbo/exhaust manifold as it is rated to 100 degrees Celsius. Custom heat shielding may be required in some instances. In the case of our demo '94 Subaru WRX, one of the neatest positions for the new solenoid was just behind the right side strut tower. On vehicles equipped with a factory electronic boost control solenoid - such as our WRX - it's essential to disconnect its hoses from the turbo pressure source (usually the compressor nozzle) and the wastegate actuator. Note, though, the factory solenoid should not be disconnected from its electrical harness - this may cause an ECU fault code. The hoses from the turbo pressure source and wastegate actuator can now be extended to the e-Boost solenoid using the supplied 5mm silicon hose or, alternatively, you can start from scratch using only the new silicone hose. Again, make sure that hose clamps are used at all connections. In the case of our WRX, we extended the factory boost control hoses to reach the appropriate ports on the e-Boost solenoid. Port 3 connects to the wastegate actuator, Port 2 connects to the turbo pressure source and Port 1 is simply the outlet for the air that's bled from the wastegate line - it can be left venting to atmosphere or routed back to the pre-turbo air intake. The WRX has a fitting on the underside of its post-airflow meter resonant chamber that is intended for this purpose. Important - the method of installation is different for vehicles equipped with an external wastegate. 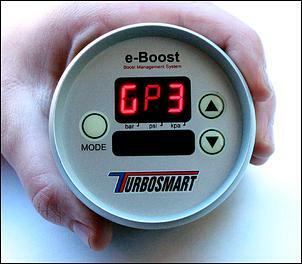 Refer to the TurboSmart e-Boost instructions for full details. The boost control plumbing is now completed - all that's left is the wiring. 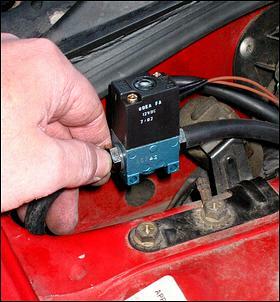 There are eight wiring connections for the e-Boost, but in most instances you'll only need to make five connections - the remaining three are set aside for running 12-volt auxiliary devices (such as an intercooler water spray) and for running external switches to change boost settings (rather than using the buttons on the face of the e-Boost unit). This feature is handy for race applications where you want to run large, easily flicked boost control switches - the ones on the face of the e-Boost are a tad fiddly. They can also be configured to provide different boost pressures in different gears. 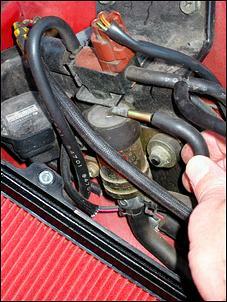 There are two wires - grey and brown - that connect to the e-Boost's under-bonnet solenoid; polarity is not important. Once these connections are made, the yellow wire should then be T-d into your vehicle's instrument illumination circuit - this connection serves to dim the e-Boost display for nighttime use. The only other two connections are switched power and Earth - easy. Note, though, the e-Boost's switched 12-volt supply should be connected to the car's wiring following the ignition switch using the supplied 5-amp in-line fuse. As always, all wiring connections should be soldered. And that's it - your e-Boost is installed! The TurboSmart instructions give full details on how to set the e-Boost to your requirements, but we'll give you a run-down of the basics. 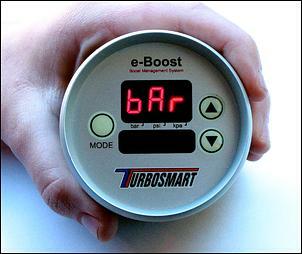 Once fired up, the e-Boost goes into Live Mode; this displays engine vacuum/boost numerically and on a LED boost graph. Your first step is to raise the default overboost shutdown (OBS) value to a level slightly above your maximum desired boost pressure. The OBS function is a clever safeguard against overboosting - whenever the entered OBS value is reached, the unit reduces boost pressure to half that set in the OBS parameter. That means if you set an OBS value of 30 psi (2.07 Bar), a potentially destructive overboost incident will instantly be pulled back to 15 psi (1.04 Bar). That might save you an engine. In the case of our WRX we were looking at running a constant 13 to 14 psi (90 to 96 kPa) boost, so we set our OBS value to 17 psi (1.15 Bar); this will shut things down before the engine starts to run lean and detonate. Another overboost safety feature is the alarm that's triggered above a predetermined boost pressure. 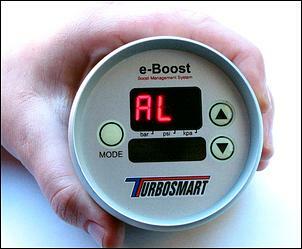 As stated in TurboSmart's e-Boost instructions, "the alarm can be used to confirm full boost has been reached or as an overboost warning. We set this to 15 psi (1.04 Bar) on our WRX. The next step is to rescale the unit's LED boost graph to suit your maximum desired boost pressure. In the bGr adjustment mode, and press the up key to set the appropriate maximum boost pressure. Once this is entered, the LED graph will reach its last (tenth) LED when you've reached maximum boost. 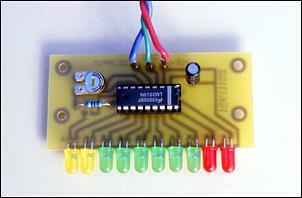 The final three LEDs are red, while the remaining seven are green. The so-called Boost Set Point determines your engine's maximum boost pressure; the Boost Set Point is a number between 0 and 99. A Boost Set Point of 0 gives no change in boost pressure over the turbo's wastegate actuator spring, while 99 allows the turbo to spin unrestricted - unlimited boost. Each vehicle requires its own Boost Set Point to obtain a given boost pressure - turbocharger size plays an important part in the determining the Boost Set Point. 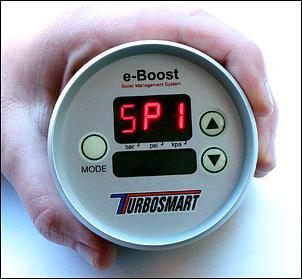 The TurboSmart instructions suggest - as a guide - Boost Set Points of 30, 40 and 50 produce maximum boost pressures of around 10 psi (69 kPa), 15 psi (1.04 Bar) and 19 psi (1.31 Bar) respectively. Determining the appropriate Boost Set Point is a matter of trial and error and, of course, it's safest to start with a low value; you want to build up to your desired boost pressure, rather than the other way around. Further to this, there is a sensitivity adjustment scale (0 - 99) that is handy for fine-tuning your car's boost curve - this can be used to dial out any boost irregularities, such as fluctuations or boost over-shoots. Note that three different boost pressures can be programmed and selected - these are known as SP1, SP2 and SP3. After you've attained your desired maximum boost pressure, you can adjust the pressure at which the wastegate begins to open - this is excellent for bringing a big turbo onto full boost quickly or, conversely, bringing boost on progressively in order to protect drivelines. The so-called Gate Pressure adjustment can be raised from the 20 kPa (2.9 psi) default value to a value fairly close to your maximum boost pressure; if you want the fastest possible boost rise, the aim is to increase the Gate Pressure to the point of not causing a boost spike. There are three Gate Pressure values to be entered - GP1, GP2 and GP3. These coincide with each boost pressure setting you select; if you select SP3, for example, you automatically get GP3 as well. Lifting boost pressure - or simply playing around with the boost control hoses for that matter - can easily lead to a blown engine if you're not super careful. Not only must you keep an eagle eye on boost pressure (preferably using a boost gauge you trust in addition to the new e-Boost display), you must also ensure the engine isn't running lean or detonating. In ideal situations, you should use a set of detonation headphones and a wide-band air-fuel ratio meter during set-up - both of which you'll likely find at good workshops. For the people doing the set-up themselves, though, an air-fuel ratio meter working off the car's oxygen sensor and an ear for the 'tink-tink' sound of detonation should be regarded as the bare minimum. Oh, and you may encounter problems when boosting a factory turbo car beyond - typically - about 15 psi. Some management systems shut off fuel and/or timing at these higher-than-normal boost pressures; an electronic fuel cut defender (FCD) is the most common way around this block. All too often aftermarket automotive products fail to live up to their manufacturer's claims and expectations - but the e-Boost is not one of those products! Once adjusted, it gives perfect boost stability as well as a noticeable difference in boost rise time. Prior to fitment of the e-Boost system we plotted our standard WRX's boost curve through first, third and part of fifth gear. As you can see, boost pressure spikes after the spool-up period (up to 14.7 psi or 1.0 Bar in first gear!) and then settles to a top-end pressure of only around 10.8 to 11.6 psi (75 to 80 kPa). Through the higher gears - third and fifth - boost came up at much lower rpm due to the greater engine load being experienced. As seen in the third gear plot, there was still a tendency for boost to overshoot after spool-up, albeit not to the same extent as found in lower gears. This was our baseline for comparison - the standard Subaru boost control system. Once the e-Boost was installed, we did a couple of WOT third gear runs with the unit programmed with quite conservative Boost Set Points - just 20 and 30 initially. Not surprisingly, therefore, these settings delivered maximum boost pressures of just 10 psi (69 kPa) and 11 psi (76 kPa) - not enough for us! We arrived in our desired 13 - 14 psi boost range with the Boost Set Point at 45 - this achieved a constant 13.3 psi (92 kPa). Once our maximum boost pressure had been set, we then adjusted the Gate Pressure to get rid of wastegate creep below 10 psi (69 kPa) boost. 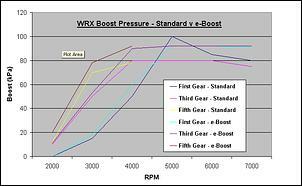 This graph compares our WRX's new boost settings with and without wastegate creep below 10 psi. Note that boost doesn't come on that much quicker, as the '94 WRX's TD05 turbo is fairly slow to spool up regardless of the boost control system it's teamed with. 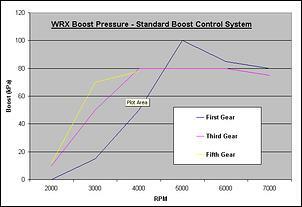 This graph compares our finalised e-Boost settings with the standard Subaru boost control system. Notice how the factory control system is all over the place - spiking to 14.7 psi (1.0 Bar) in first gear and typically falling to just 10.8 to 11.6 psi (75 to 80 kPa) toward the redline in each gear (we can only assume this trend occurs in fifth gear). The e-Boost, on the other hand, holds boost beautifully at 13.3 psi (92 kPa) in each gear all the way to redline. And it does this regardless of ambient temperature - though the minimum and maximum daytime temperatures were not that far apart at the time of our testing. Criticisms? Heck, there's not much. We found the buttons on the face of the e-Boost a little fiddly to operate on the move and there's no question a conventional needle-type boost gauge is easier to read than its digital and bar graph display. Oh, and - as mentioned - the unit can be difficult to mount in an ideal position. The TurboSmart e-Boost is quite straightforward to install and set-up (which is good if you're doing it all yourself or you're paying a workshop an hourly labour rate) and - most importantly - it performs extremely well. It holds boost absolutely perfectly, you can adjust the rate of boost increase to suit and it offers a number of useful features. This is a very good closed-loop boost controller. 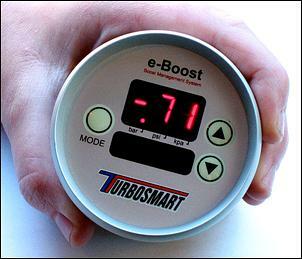 The e-Boost controller is available from the AutoSpeed Shop. 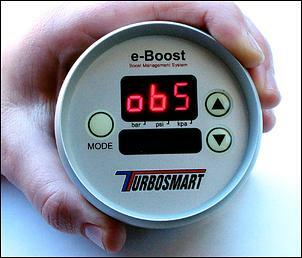 The e-Boost controller was supplied for this test by TurboSmart Australia.